Jurassic Snack is a light 2 player only game. Combining awesome dinosaur miniatures with a legendary designer (Bruno Cathala) really peaked my interest, but after reading the rules I feared it would be a little too light for my taste. I was wrong! 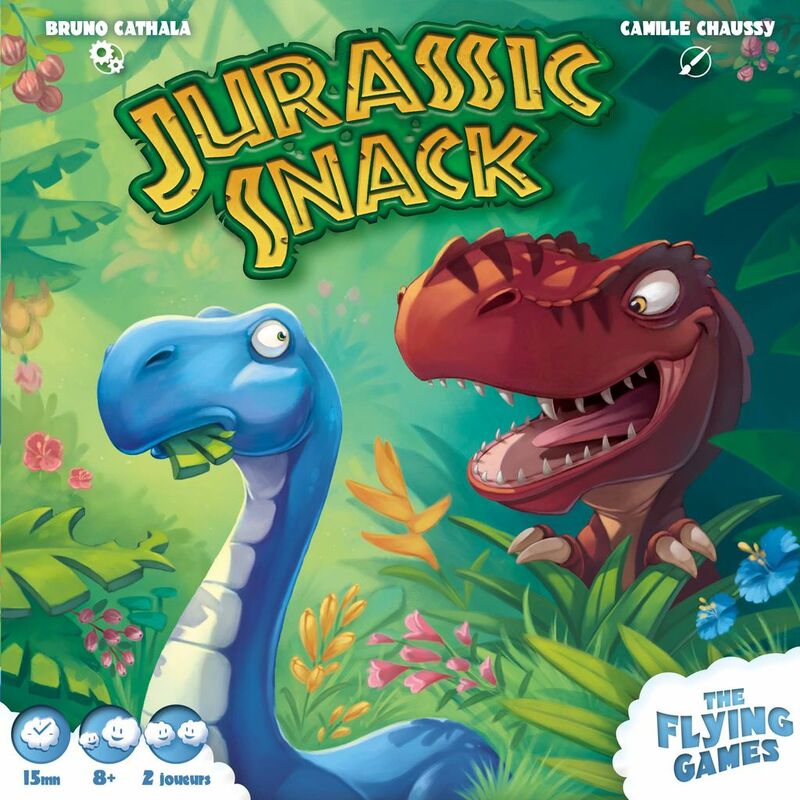 While there is no doubt the game is light, has “luck of the draw” elements and an advertised 15 minutes play time (that actually seems to be accurate), Jurassic Snack does offer some very interesting, meaningful choices and more depth than its cute theme would suggest. Jurassic Snack is a game all about tactical movement of your dinos, to acquire the grass tokens worth the most points. The trick is that you don’t know how many points a grass token is worth before you pick it up. Some of them give you a special free action while others can spawn the “ferocious” T-Rex (that will scare away one of your dinos, but give you lots of points). Once the T-Rex is in play, people can also move it around the board and scare away the other players dinos. But doing this of course means you aren’t picking up grass and scoring points. It’s all about where you move your dinos, how to cut off the other player from getting grass, and possible moving the T-Rex to scare away one of the 4 dinos they have on the board. Overall I found Jurassic Snack really enjoyable. I played 3 games in a row the first time it hit my table. All the games evolved differently, and felt smooth. It’s a testament to great design when a game can have such a simple streamlined rule set and still be a game with depth and variability. I highly recommend this to anyone that enjoys 2 player strategy games. It’s also a great game for the more casual players. But watch out for that T-Rex, it can be really mean.